Chicken breasts get big BBQ taste, plus melty cheese and sautéed onions, in these mouthwatering sandwiches. 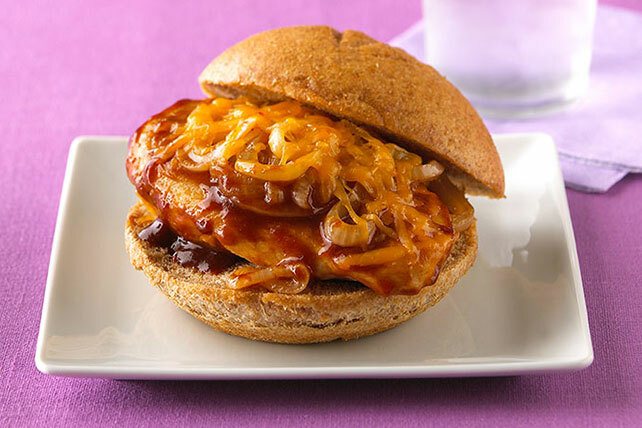 Grab a stack of napkins—these Cheesy BBQ Chicken Sandwiches are saucy! Heat large nonstick skillet sprayed with cooking spray on medium-high heat. Add onions; cover. Cook 2 min. ; stir onions, then move to edge of skillet. Add chicken; cook 4 min. Turn chicken over; top with barbecue sauce. Cook, covered, on medium-low heat 6 min. or until chicken is done (170ºF). Stir onions. Top chicken with cheese; cook, covered, 1 min. or until melted. Fill buns with chicken and onions. Always cook chicken until well done, not medium or rare. If using a meat thermometer, the internal temperature should register 170ºF when the thermometer is inserted into the thickest part of one of the thighs. (Make sure the thermometer does not touch the bone.) When the chicken is completely cooked, the juices should run clear.